Rainer is Professor of Modern European History at the University of Essex and the programmer of the University of Essex’s annual Holocaust Memorial Week. In today's blog, Rainer gives a brief overview of the oppression and persecution of the Roma in eastern and south-eastern Europe during the Second World War. Most inmates of the Auschwitz Zigeunerfamilienlager were Sinti from Germany, Austria and the Low Countries. Sinti from these areas also ended up in other SS-run concentration camps, such as Dachau, Neuengamme, Sachsenhausen or Ravensbrück, as did several thousand Roma from France. Yet the largest numbers of European Roma lived in the countries of eastern and south-eastern Europe, some travelling, some sedentary. Here, oppression and persecution during the Nazi period often took a very different form. Life was made very hard everywhere for the Roma, their rights were severely restricted, and Roma men were often recruited to labour brigades where they were forced to work under harsh conditions. However, the number killed indiscriminately varied widely. In the Protectorate of Bohemia and Moravia, the Nazi-occupied Czech part of interwar Czechoslovakia, the first deportations of Roma to labour camps happened immediately after the German occupation in 1939. In 1942, two camps set up for the ‘work-shy’ and ‘criminals’ were converted into concentration camps for around 2,600 Roma, guarded by local police: Lety in Bohemia and Hodonín in Moravia. More than half of the prisoners were later deported to Auschwitz. As the German army invaded the Soviet Union in the summer of 1941, the troops were followed by the Einsatzgruppen, mobile killing squads under the command of the German Security Police and the Security Service (SD). Their task was to round up and summarily execute all those the Nazis regarded as political or racial enemies. In addition to Soviet commissars and Jews, this included Roma. In many parts of the Soviet Union, German troops and Einsatzgruppen were supported in their hunt for Roma by local people, who were fuelled by deeply engrained anti-Roma attitudes that they could now translate into action. The Roma were massacred where they were found, and few, if any, records were kept of names or numbers. At around the same time, the oppression of the Roma in occupied Poland turned into outright persecution. From 1942, Roma were forcibly resettled to Jewish ghettos or deported to forced labour camps. There were large-scale massacres, often committed by local Polish or Ukrainian gangs. 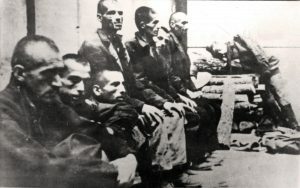 Polish Roma also faced deportations to the death camps of Auschwitz, Bełżec, Chełmno, Majdanek and Treblinka. 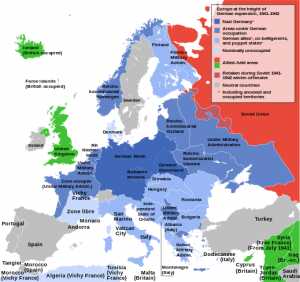 After Germany and her allies conquered Yugoslavia in 1941, the country was split up. Serbia came under direct German military administration, and the German authorities included Roma in the pool of ‘hostages’ who were executed in retaliation for every Wehrmacht soldier killed by the partisans. There were massacres of Roma, and special camps were set up for them, among them Crveni Krst in Niš. Roma were also killed in a mobile gas van – a sealed truck which had its engine fumes diverted to the interior compartment. It had been sent directly from Berlin, and similar gas vans were experimented with at the same time for killing Jews and Roma in occupied Poland. In the puppet states and allied countries, the Nazis were happy to let the ruling regimes deal with their respective Roma populations. 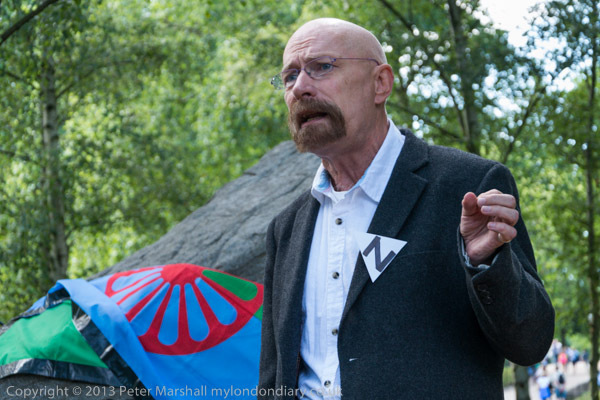 Most did not need much prompting as anti-Roma sentiment was rife everywhere. The Ustaše regime In Croatia persecuted the Roma ruthlessly, deporting them to labour camps and to the Croatian-run Jasenovac concentration camp. A few ended up at Jasenovac’s special Roma section Camp III C, but most were exterminated shortly after their arrival. Between 10,000 and 20,000 Roma are currently estimated to have perished at Jasenovac alone. In Romania, the pro-Nazi Antonescu regime deported more than 26,000 Romanian Roma between 1942 and 1944 to Transnistria, the strip of Ukrainian territory between the rivers Dniester and Bug occupied by the German and Romanian armies. There were no provisions in place, and the Roma were left to fend for themselves. As a result of this systematic criminal neglect, up to half of the deportees died of starvation, exposure to the elements and disease. Hungarian officials had proposed the deportation of Roma to special camps since the 1930s, but it was only after Hungary entered the Second World War in 1941 that Roma men were forcibly conscripted into the army and sent to the eastern front, and their families resettled into ghettos – the first of which were set up before those for Jews. The persecution gathered pace after the German occupation of Hungary and the takeover of power by the fascist Arrow Cross movement in 1944. All remaining Roma men were conscripted into labour brigades, some were deported to SS-run concentration camps and others were massacred. The collaborationist government of Slovakia spared the Roma from deportations until autumn 1944, although many had been driven out of their homes. It was only after the unsuccessful uprising against the regime, which the Roma were considered to have supported, that Roma were subjected to systematic pogroms and massacres. In contrast to the persecution of the Jews, the oppression Roma endured varied from country to country, and from region to region. The diversity of experience and the anonymity of so many Roma victims have made it difficult to develop an overall unifying narrative that can be transmitted to the younger generations of both Roma and the wider society. What is more, for many Roma in eastern and south-eastern Europe, their persecution during the Nazi period does not stand out as something all that memorable. The severe discrimination and marginalisation they have continued to experience since the end of World War Two highlights their persistent subordinate position within society today.